So I finished and sent off my swap for Craftster, and it should be arriving soon. I'm going to go ahead and put up pictures because I'm a cheeky monkey like that. The first thing I worked on was the biggest and newest to me. 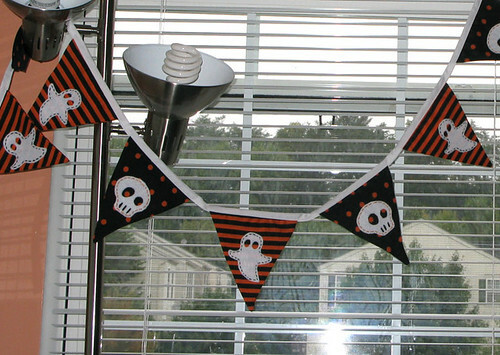 Bunting. I had never heard of the stuff before, but once I looked it up I recognized it. I don't know what I used to call this stuff before I knew the proper term, probably something like "little flags". I found a tutorial at Joyful Abode and it was really helpful, and I really liked the results. Using the bias tape gave it a nice finished look. I made and attached little felt appliques...by hand. I forget how many ghosts and skulls there were exactly, but by the end I thought it was a lot! 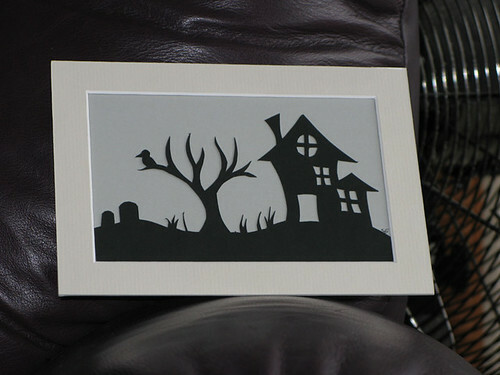 The next two things I made were a spooky paper-cut, and a felt embroidery hoop decoration. I hadn't actually done either of these before either, but at least had done enough similar things that I was pretty confident in being able to pull them off. 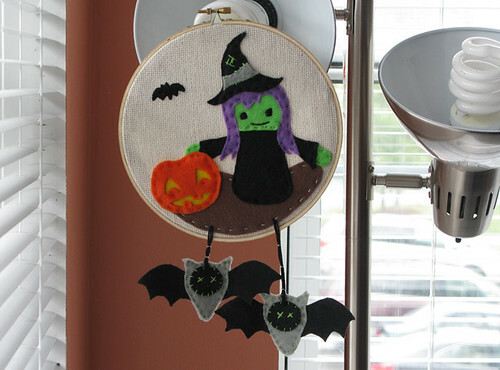 I wanted to make it a little unique so I added the dangling bats to make it a bit more than just a plain hoop. One swap down, two more to go! Then I'll have to take myself out of the swap ring for a while for personal projects and other exciting happenings. Lucky swap partner! Your creations are amazing!